EAST HADDAM— I-Park artists-in-residence program welcomed six new artists to its campus this week for the final residency of 2017. The artists represent a variety of disciplines, from architecture to moving image, and hail from the four corners of the globe. Their stay will culminate in an Open Studios day November 19 from 2 to 5 p.m., when the public can meet the artists and view some of the work they’ve produced during their residency. Zhiwan Cheung, a moving image artist from Pennsylvania, creates films that probe the intersection of national identity and personal psyche. Adam Haddow is an Australian architect whose work focuses on a sense of place and the patterns that appear in the natural and built environments. Xiao Li is a visual artist and curator from Japan participating in her first U.S. residency. 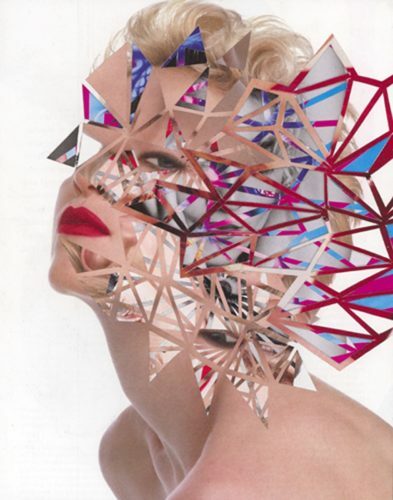 Her art probes the intersections of art and nature and art and science. Julie Anne Mann is a New York–based visual artist who uses materials found in nature to create botanical compositions that encourage us to see the natural realm in a new way. Helen Betya Rubinstein is a writer and essayist from Iowa developing a nonfiction book about her family’s history and heritage. Joseph Tasnadi is a Hungarian visual artist whose multimedia installations explore the relations between information and artistic expression, information and aesthetics, and information and philosophy. During their fully-funded residencies at I-Park, each artist will enjoy a private studio and shared accommodations in a c. 1840 farmhouse. Each individual is free to pursue projects of his or her choosing, with minimal distractions except the lure of nature and the camaraderie of their fellow residents. I-Park is an artists-in-residence program offering fully funded four-week residencies in visual arts, architecture, moving image, music composition/sound art, creative writing and landscape/ecological design. Since its founding in 2001, I-Park has sponsored more than 850 residencies, and has developed cross-disciplinary projects of cultural significance and brought them into the public domain. Set within a 450-acre nature preserve, I-Park encourages dialogue between the natural and built environments, and has been the setting for exhibitions, performances, symposia, and programs that facilitate artistic collaboration. For more information, visit i-park.org. CHESTER — House of Peace & Justice, a new illustrated book profiling 100 years of Jewish farming and community in the shoreline-lower Connecticut River area, is to be released in a celebration scheduled for Sunday, Oct. 29, at 11:00 am, at Congregation Beth Shalom Rodfe Zedek, 55 E. Kings Highway, in Chester, CT. The event is free of charge, open to all, and features brunch with foods linked to early Jewish farming in Connecticut. Three years in the making, House of Peace and Justice, The First 100 Years of Congregation Beth Shalom Rodfe Zedek chronicles the development of the synagogue from its dual roots: in a small rural temple, Rodfe Zedek (‘Pursuers of Justice’), founded in 1915 by hardscrabble Jewish chicken farmers in Moodus, and in another small Jewish group formed in Chester and Deep River in the 1930’s that grew into the Jewish Community Center, later Congregation Beth Shalom (‘House of Peace’) in Deep River. 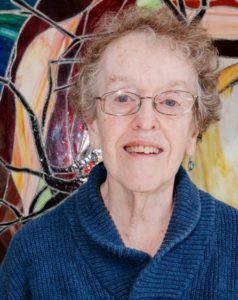 Author Ellen Nodelman unearthed colorful details ofmomentous events in the Jewish community of the area, including how the two synagogues merged in 1998 to form one, Congregation Beth Shalom Rodfe Zedek. 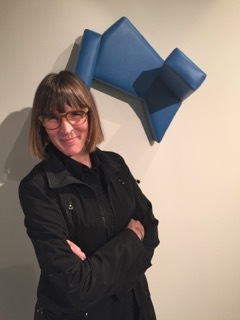 The fused congregation moved in 2001 to its current home in Chester, a building renowned in the international art world as the only public space designed by 20th century artist, and CBSRZ congregant, Sol LeWitt. Few American synagogues have their origins in farming communities. And few American synagogues can claim as diverse and wide-ranging a membership as today’s CBSRZ which has included not only business people, doctors and lawyers but artists, writers, teachers, politicians, musicians, media stars, and even a farmer or two. It marked its 100th birthday in 2015. The launch event on October 29 will feature three speakers: Ellen Friedman, Jon Joslow, and Michael Price, representing Rodfe Zedek, the JCC/Beth Shalom and the merged CBSRZ. Rabbi Marci Bellows will moderate a session for long-time community members to share memories. House of Peace & Justice author Ellen Nodelman will read selections from the new book. The general public is invited to attend the Book Launch celebration, a very special event not only for CBSRZ and the larger Jewish community in Connecticut but for everyone interested in the history of the shoreline and lower Connecticut River valley. Visit www.cbsrz.org to RSVP by Oct. 25. Books will be available for purchase at the book launch (list price: $36). For a discounted pre-publication price of $27, books may be ordered on the website until the 27th of October and picked up at the book launch. Congregation Beth Shalom Rodfe Zedek is located at 55 East Kings Highway in Chester. For more information, contact the office at CBSRZ: 860-526-8920. AREAWIDE — The Country School is holding an Open House Sunday, Oct. 28, from 1 to 3:30 p.m. This event offers the opportunity to meet engaged students and teachers, and hear about the rigorous academic program at the school with its commitment to honoring the creativity and exuberance of childhood. Learn about the school’s signature programs – STEAM, Elmore Leadership, Outdoor Education, and Public Speaking – and its extensive offerings in the arts and athletics. Tour the recently renovated 23-acre campus, with its new outdoor athletic complex. Hear where alumni have continued their education at top high schools and colleges across the country and how they have thrived at these institutions. Founded in 1955, The Country School is a coeducational, independent day school serving students in PreSchool through Grade 8. To learn more and register for Sunday’s Open House, visit this link. 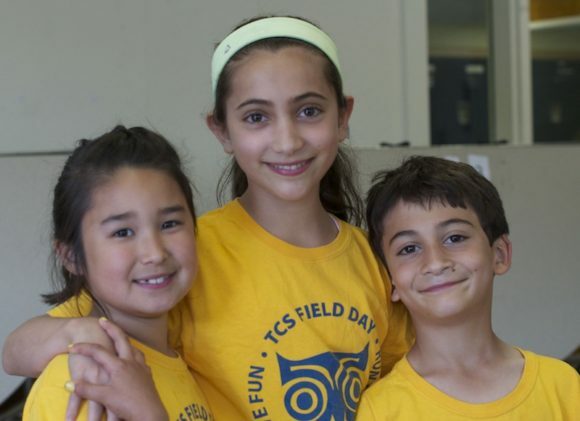 For information about the $10,000 60th Anniversary Merit Scholarship opportunity for students entering Grades 4-8, visit http://www.thecountryschool.org/scholarship. 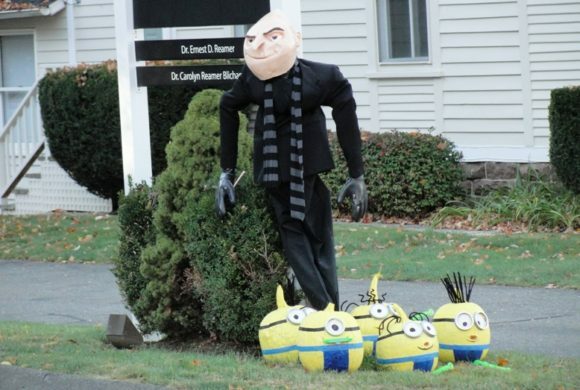 Gru and the Minions made an appearance at the 2015 Scarecrow Festival. Photo by Elizabeth Cadley. ESSEX — The scarecrows are coming! The Essex Board of Trade will host the annual Scarecrow Festival on Saturday Oct. 14. Local merchants and community organizations as well as individual residents and families all contribute life-size straw figures for the event. The goal is to have enough scarecrows for all the lampposts on Main Street in Essex and Ivoryton. Judy Heiser of the Essex Board of Trade notes, “It’s never been a problem to get them; people are really enthusiastic about this.” The scarecrows come in all sorts of garbs, from lacy wedding dresses to Cub Scout uniforms from the local troop. Restaurants often make chef scarecrows. Heiser described the scarecrows fashioned by the Essex Hardware, which has put several straw men in front of its building, as “a bit gory, very interesting, and very hardware store-ish.” This year there are themes as well: Best Town Spirit, Most Creative, Most Beautiful, Most Original, and Scariest. The scarecrows need to be delivered to Jim D’Alessio at J. Alden Clothiers on Essex Main Street by Oct. 4. Once they are installed, everyone is encouraged to visit and vote for their favorites! Ballots are available at participating merchants in town. Scarecrow voting will take place until Oct. 29, with winners announced on the 31st. Browse the Village Shops, and more! The Essex Board of Trade includes virtually every type of business within the three villages that comprise Essex Township. The EBOT organizes many of the events in Essex that have been family traditions for years. The EBOT also supports numerous non-profit organizations by offering them low cost memberships and assists them in their various events and causes. For more information about the Essex Board of Trade, its programs, and members, visit essexct.com. Inspiration for designs comes from movies, Halloween themes, and even famous musicians! Photo by Elizabeth Cadley. 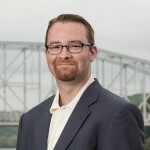 AREAWIDE – State Representative Robert Siegrist (R – 36th) voted Thursday for a bipartisan budget that averts Gov. Malloy’s proposed education cuts to cities and towns, and installs structural municipal mandate reform. The plan passed the Senate 33-3 Wednesday evening and by 126-23 in the House of Representatives on Thursday. The budget now awaits action from the governor. ESSEX — Call for Artists! Design the front of a holiday greeting card and be eligible to have your original artwork displayed on the walls of River Valley Junction for the holidays. The contest will be judged for three age groups – adult, young adult (ages 12-18), and youth (ages 7-11). Visit the Essex Steam Train & Riverboat website and look under “Specials” for contest details. Submit your entry by Oct. 25, 2017. Winners will be announced on Oct. 26, 2017. Prizes will be awarded in all categories. For further information contact Pam Amodio at 860-767-0103, Ext 217 or email at pamodio@essexsteamtrain.com. IVORYTON — Worship Services for the Ivoryton Congregational Church are now being held at the First Congregational Church, 6 Methodist Hill, Essex, from 8:45 a.m. to 9:30 a.m. with Rev. John Van Epps, Pastor. Fellowship follows the worship service. Bible Study is held on Tuesday mornings from 11-noon in the parlor of the Essex Congregational Church with Rev. John Van Epps facilitating. AREAWIDE — This holiday season brings a new program – “Caroling For A Cause” to the Essex Steam Train & Riverboat. Created as an opportunity for local non-profits, school groups, families, church choirs and other organizations to raise funds for their favorite charity, this program will also bring additional cheer and holiday spirit to the railroad’s Reindeer Breakfast and Santa Special events. As “street-singers for donations,” groups volunteering to sing their favorite holiday songs will keep 100 percent of the donations they collect to give to the charity of their choice. Additionally, as thanks for their participation, the Essex Steam Train will also make a $100 donation to the chosen charity. Two-hour performance slots are available on Saturdays and Sundays from 10 a.m. to 12 p.m. or 12:30 to 2:30 p.m., on a first-come, first-served basis. Professional training or talent are not required – only an enthusiasm for the holiday season and a desire to help a worthwhile charity. For further information or to reserve your group’s spot, contact Pam Amodio at 860-767-0103, Ext 217 or email at pamodio@essexsteamtrain.com. 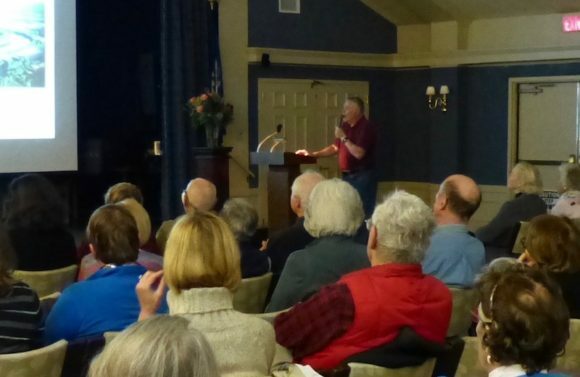 State Geologist Ralph Lewis gives one of his popular lectures. ESSEX — The Essex Land Trust has announced a Geology Cruise on the Connecticut River, Wednesday, Oct. 25, 1:30 p.m., Following his lecture on the Geologic History of the Lower Connecticut River Valley back in April, former Connecticut state geologist Ralph Lewis will lead a trip down the Connecticut River to explore ancient geological formations. A certified professional geologist with 40 years of experience, Ralph Lewis is also co-author on the “Glacial Geologic Map of Connecticut and Long Island Sound Basin”. Essex Land Trust will be cruising with RiverQuest and setting out from Eagle Landing State Park, Haddam CT. Reservations are required: $30/person. Limited spaces available. BYO picnic/beverage. Bad weather cancels. The Honorable Robert Richardson, United States District Judge Magistrate, District of Connecticut administered the oath taking, in which 50 people from over 20 different countries became United States citizens. ESSEX — On Tuesday, Oct. 17, at 11 a.m., the Connecticut River Museum hosted a naturalization ceremony for 50 immigrants from around the world. The ceremony took place on the Museum’s main lawn, directly overlooking the Connecticut River. U.S. Citizenship and Immigration Services (USCIS) presented candidates for naturalization to the U.S. District Court for the District of Connecticut. 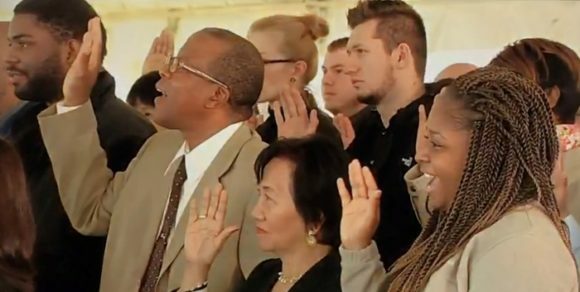 The Honorable Robert Richardson, United States District Judge, District of Connecticut, administered the Oath of Allegiance to America’s newest citizens during the naturalization ceremony. 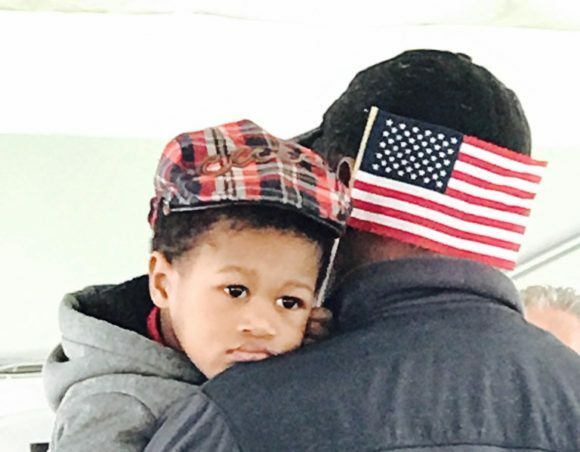 This young gentleman was waiting so patiently for his mom to become an American citizen. Photo by Phyllis Stillman. Honored guests and speakers included: The Honorable Robert Richardson, United States District Judge Magistrate, District of Connecticut; Joe Courtney, U.S. Representative; Norm Needleman, First Selectman of Essex; Robert Siegrist, State Representative; and Yanira Rios, Research Aid & Outreach Organizer for the office of U. S. Senator Richard Blumenthal. Along with the dignitaries, the John Winthrop Middle School’s 8th grade chorus, under the direction of Laura Traver, led participants in singing the national anthem and “My Country ‘Tis of Thee”. The Connecticut River Museum is located on the waterfront at 67 Main Street in Essex and is open Tuesday – Sunday, from 10 a.m. to 5 p.m. The Museum, located in the historic Steamboat Dock building, offers exhibits and programs about the history and environment of the Connecticut River. For a full listing of Museum programs and exhibits, visit ctrivermuseum.org or call 860-767-8269. October 21, 2017 by Peter Arseneault Sr.
We already know what a disaster the Democratic Party has imposed on us through overspending, and we can only expect more of the same from them by reelecting them to office. It’s time to take a different path, time to write tomorrow’s history, time to think ahead to our future and the future of our children, time to vote Republican. And there’s nothing progressive about Progressive Democrats. It’s time to make a quality of life change for the better, time to put the doom and gloom behind us. It’s time to vote out those Progressive Democrats that are responsible for this financial mess. Norm in Essex this past summer. Remember who said he didn’t have to raise taxes because the state was in great shape before he got reelected. Norm say’s Essex is in good shape financially now, but what will he say on November 8th. Let’s skip the November 8th surprise and Vote for Vin Pacileo, 1st Selectman on November 7th in Essex, and Carolyn Linn and James Grzybowski in Chester. Please join me, a proud Republican in voting for the Republican Candidates this November 7th. It could be a life changing event with lower taxes. Editor’s Note: The author is the chairman of the Haddam Republican Town Committee. DEEP RIVER — Join Deep River Public Library on Saturday, Oct. 21, from 1 to 2:30 p.m. to welcome psychic and medium, Paul Rice. Rice will hold a lecture and answer questions centered on the topic of helping ghosts move on. Rice has experience that includes ghost hunting, palm reading, astrology and massage therapy. He excels at Energy Work, which is the practice of correcting imbalance through touch. This program is open to all. No registration required. OLD SAYBROOK — The public is welcome to Silent Journey Curriculum Night at The Children’s Tree Montessori School, 96 Essex Road, Old Saybrook Thursday, Oct 26, from 5:30 to 7:30 p.m. Learn about their Independent Elementary School, Toddler and Preschool. A free workshop will be offered. Dinner and childcare will be available for $10 per family. The ‘Essex Attic’ is always a popular attraction at St. John’s Annual Rummage Sale! ESSEX — Once again it’s time to come down to Essex and ‘RUMMAGE!” Visit the 75th Annual Rummage Sale at St. John’s Episcopal Church and find the treasures you have long been seeking. The Sale will be on Friday and Saturday, Oct. 20, and 21, from 9 a.m. to 2 p.m. It is a huge sale – this year there are lots of excellent furniture, small appliances, clothing – modern and vintage, books, etc., including hundreds of items under $10. Come across a real fashion find in the Boutique. “Essex Attic” has exceptional treasures and of course there is really cool costume jewelry. The Silent Auction is just remarkable. Cider and donuts will be available, and on Saturday there will also be a bake sale, plus hot dogs. Clarinetist Ken Lagace will lead a full day clarinet workshop, Oct. 21. 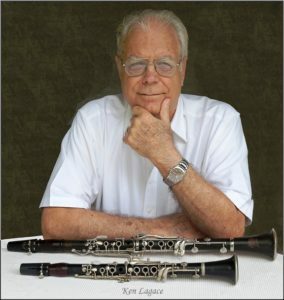 CENTERBROOK – Community Music School presents master clarinetist Ken Lagace, who will lead a full day of workshops on Saturday, Oct. 21 from 10 a.m.to 4 p.m., focusing on intermediate/advanced level clarinet technique on a wide range of topics. The intensive will be hosted on Community Music School’s main campus in Centerbrook and will cost $95, with lunch included. Register online at www.community-music-school.org/clarinet-intensive or by calling 860-767-0026. The morning session will include in-depth information on clarinet reeds, including how to select them, maintain them, fix them, properly play them, and even how to make them. The afternoon session will provide an introduction to Lagace’s signature REALM method, which stands for Reed, Embouchure, Air, Ligature, and Mouthpiece. This method teaches players to achieve an excellent sound with flexibility, range, control, and many other aspects of good clarinet performance. Each session will be followed by a chance for the participants to experiment with their newly learned skills. During the final session, participants will be broken into two or more groups where they can apply their new techniques in a chamber ensemble setting, with feedback from Lagace and other clarinet instructors. Lagace received his Bachelor of Music degree at Hartt College of Music (CT) in 1960. He studied with Keith Wilson at Yale in 1955, Bernard Portnoy in New York City from 1958 to 1960. He served as a member of the US Coast Guard Band and studied with Kalmen Opperman in New York City from 1962 to 1966. He instructed at the Hartt College of Music (CT) from 1966 to 1987. Under the tutelage of Kalmen Opperman, Lagace learned to make his own reeds and reface clarinet and saxophone mouthpieces which has become a skill he willingly shares with his peers. He was a member of the Hartford (CT) Symphony Orchestra from 1966 to 1987 playing Assistant Principal Clarinet, Bass Clarinet and Eb Clarinet. He was Principal Clarinetist in the Hartford (CT) Chamber Orchestra from its inception until 1987. His performances include many on TV and Radio, and at Lincoln Center (NYC) and Carnegie Hall (NYC) with the Hartford Symphony. He also made a CD recording of the Mozart Clarinet Concerto with the Hartford (CT) Chamber Orchestra in 1976. In 1987 Mr. Lagace abandoned the clarinet to program computers and in 2008 after retiring, dusted off the clarinet and is enjoying being back in the clarinet world again. Community Music School offers innovative music programming for infants through adults, building on a 30 year tradition of providing quality music instruction to residents of shoreline communities. CMS programs cultivate musical ability and creativity and provide students with a thorough understanding of music so they can enjoy playing and listening for their entire lives. Learn more at visit www.community-music-school.org or call (860)767-0026. The next presentation in the Centerbrook Architects Lecture Series is, The Russians Are Coming! 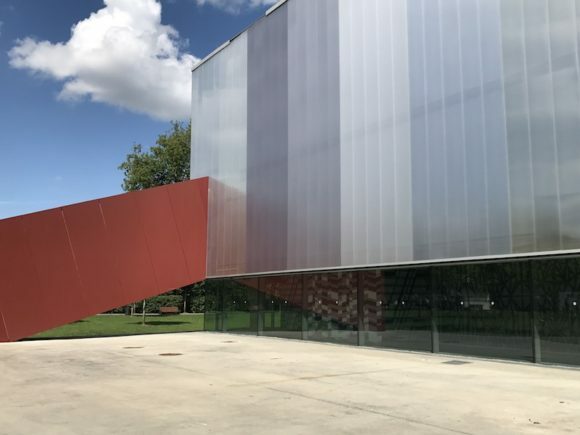 The Russians Are Coming!’ On Friday, Oct. 20, at 7 p.m. Centerbrook Architects Principal Jim Childress, FAIA will take the audience on a whirlwind illustrated tour in The Cube at their office of some of the best architecture, new and old, from Cuba, St. Petersburg and Moscow. Enjoy images of wonderful examples of mid-century modern houses in Cuba, and some of the best contemporary architecture in Russia including the Boris Eifman Dance Academy, the Garage Museum of Contemporary Art and the renovated French Impressionist wing of the Hermitage Museum. Childress has won more than 60 design awards including the American Institute of Architects 1998 Architecture Firm Award. In 1994, he was selected as one of the decade’s “40 National Architects under 40” by the Architectural League of New York and Interior Magazine. He was invested, for design, into the College of Fellows of the American Institute of Architects in 2001 and recognized for Professional Achievement by the Rhode Island School of Design at their 2005 Commencement. He is a long-standing member the National AIA Committee on Design, serving on its Advisory Group and as the 2015 Chair. This presentation is free and open to the public. Call the Essex Library at (860) 767-1560 for more information or to register. Centerbrook Architects office is located at 67 Main St. in Centerbrook. AREAWIDE — Gather your friends and head on down to Hadlyme for the First Annual Foliage Folk Festival. 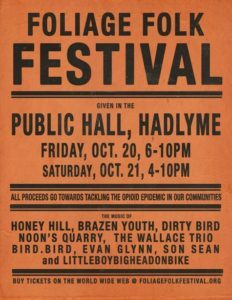 A two-day event full of music, craft vendors, art, food trucks and valuable education on tackling the opioid epidemic in our communities at the Hadlyme Public Hall on Friday, Oct 20, from 6 to 10 p.m. and Saturday, Oct 21, from 4 to 10 p.m. Accidental overdose is the leading cause of death of Americans under 50, surpassing car accidents. And this year, the Office of the Chief Medical Examiner projected that CT will likely have more than 1,000 people die from drug overdoses, a skyrocketing figure when compared to 2012, when fatal overdoses totaled 357. But still, only 1 in 10 Americans with a substance use disorder receives treatment and research shows that stigma keeps people from getting the treatment they need. Help us #stopthestigma, get connected to resources to help the people you love while also having a fun-filled night!! The event features local talent such as Honey Hill (East Haddam/Brooklyn), The Brazen Youth (Lyme), Noons Quarry (East Haddam), The Wallace Trio (Guilford) and acts from Brooklyn and Boston. All proceeds raised will be donated to organizations working to address the opioid epidemic in Connecticut. Tickets are $25 per night per adult, $40 for a weekend pass, $10 for people 17 and under and free from kids under 6. For more information and to buy tickets, visit our website at foliagefolkfestival.org or call Theresa Govert at 860-817-3115. 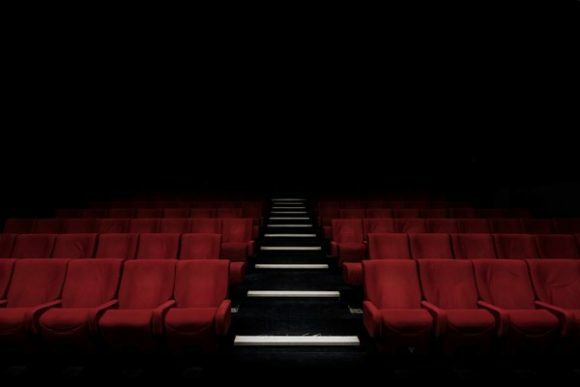 AREAWIDE — Artful Living, Killingworth’s multi-generational community theatre, is seeking original scripts of short plays from Connecticut high school students. This new program, Playwrights For Tomorrow, offers students the opportunity to win a scholarship and have their play produced on stage at Old Saybrook’s Katherine Hepburn Cultural Arts Center (The Kate) on April 29, 2018. Plays will be reviewed by a panel of theatre professionals. Selected playwrights will be offered the opportunity to collaborate with directors and other theatre artists in the staging of their plays. Submission Deadline is Jan. 8, 2018. 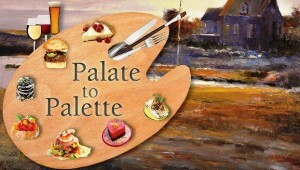 AREAWIDE — Lyme Art Association (LAA) hosts a delicious and art-filled fundraiser, ‘Palate to Palette,’ Oct. 19, from 6 to 9 p.m. Enjoy a sumptuous offering by the area’s top restaurants and caterers, plus a variety of craft beer and wine. The event includes a silent auction featuring works of art specially created by LAA member artists as well as celebrity artists. Tickets are $45 for LAA members, or $50 for guests. I know the answer. He is right here in Essex, doing good things for the town of Essex, governing cooperatively, giving generously and thinking proactively. I may not agree with everything that he has done, but I do beleive Norm Needleman is THE choice for Essex, Centerbrook and Ivoryton. We need to continue doing exactly what he, Stacia Rice-Libby and Bruce Glowac have been doing right alongside the Boards of Finance and Education and the various commissions of our town. While Connecticut crumbles around us, we are seeing new development, public land acquisition, improvements to our infrastructure, buildings and programs, all at a very reasonable cost to the taxpayers. I pay taxes in Essex, I volunteer in Essex, I live in Essex. The cooperation and consideration of the leadership here in our town, on both sides of the political divide, show just how easy it is to get things done when reasonable people put differing labels aside and work towards a common goal. Leave aside the derisiveness of state and national politics, and focus right here at home. I am both proud to live and in a town as well managed and governed as Essex. I endorse Vin Pacileo for First Selectman of Essex. Under the Malloy Budget, Education Cost Sharing Grant for Essex will be 0. I don’t know why the Governor’s Budget would pass on his irresponsibility to Towns and Cities. Education for goodness sake! Isn’t that a bi-partisan issue? Vin Pacileo vows to confront the Governor for fair state funding. I agree with him. Contrast this with our present First Selectman who wants to use our “rainy day fund” to close the loss. Isn’t that just giving up? Surely, there are other things we need to fund in Essex, perhaps an even larger amount to fund the pension, or the Library or the Fire Department. Personally, I believe our present First Selectman should join those Selectmen and Mayors working to force Governor Malloy to find other means to solve Connecticut’s budget crises. After all the Governor would listen to someone who gave a substantial donation to his campaign. Governor Malloy shows that he is not bi-partisan, since he vetoed a bi-partisan budget that was passed in the General Assembly. He might listen to a Democrat. Since, I served on the Board of Education In Portland, I know that our state has burdened the towns and cities with expensive unfunded mandates for years. In a ValleyNewsNow.com article, dated September 15, 2017, Norm said, “ if re-elected he will continue to fight the proliferation of unfunded mandates.” He has the “bully pulpit” now. Why not fight now? This is not just a state issue, it effects Essex. Change Starts Locally. I want a First Selectman who will fight for Essex. Vin Pacileo is that man. I urge you to vote for Vin Pacileo on November 7. Suisman Shapiro Sponsored Post: While many Connecticut drivers believe that those traveling long distances may be more likely to become involved in a car accident, the fact is that many crashes actually occur within 25 miles of home. Part of the reason many accidents occur near home is because driving in familiar places can cause drivers to rely on memory instead of what is happening around them. This auto-pilot phenomenon can prevent people from remaining vigilant while driving, potentially causing them to miss important visual cues. It is imperative that drivers combat this phenomenon by staying awake and alert as unpredictable elements, such as other drivers, crossing animals or mechanical failure, can always cause an accident. However, because others are also likely driving on auto-pilot, motorists should also ensure that they always buckle their seat belt no matter how far they are driving. Further, fatal car accidents are more likely to occur at certain times of times of the day, particularly when workers are heading home or when residents are out running errands. For example, 16 percent of fatal accidents that occurred in 2013 took place between 3 p.m. and 6 p.m.. Further, 31 percent of car accidents in 2013 occurred between 6 p.m. and midnight. Car accidents that occur on interstates, local highways or even rural roads can result in serious injuries or even death. 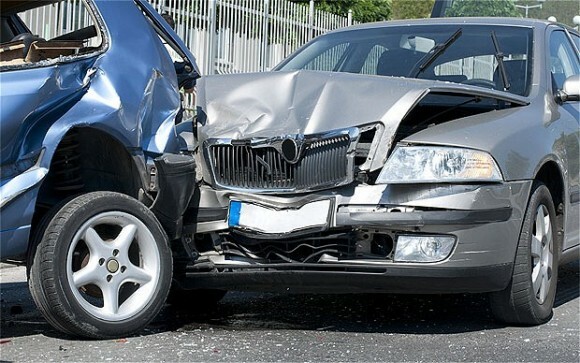 If the accident occurred due to another driver’s negligence or risky driving habits, those who suffered injuries could seek compensation for the damages they sustained in the incident, including recovering the cost of their medical bills, lost income and pain and suffering. However, some insurance companies may attempt to settle the claim for less than what the injured individuals need. In such an event, filing a lawsuit against the at-fault motorist with an attorney’s help might be advisable. The Law Firm of Suisman Shapiro focuses on this area of the law. ESSEX — Start your engines! From sleek vintage roadsters to classic muscle cars, Essex Historical Society’s Antique & Classic Car Show highlights the best of automotive history. All photos courtesy of Essex Historical Society. Essex Historical Society (EHS) is partnering with Essex Automobile Club & Antique Auto Service to present the 7th Annual Antique & Classic Car Show & Tour Sunday, Oct. 15, from 11 a.m. to 2:30 p.m. This annual event combines the best in viewing classic cars, followed by a fall foliage tour around the area. Held on the beautiful grounds of the historic Pratt House, 19 West Ave., Essex, the car show welcomes all antique and classic cars 25 years and older, with no entrance fee. Exhibiting cars may arrive after 10:30 a.m. The general public is welcome to attend this family-friendly, free event. Onsite refreshments will be available for purchase, provided by Porky Pete’s Catering. See antique cars of all kinds on Saturday, Oct. 15. Since it will be the height of fall foliage season, exhibitors are welcome to join in a driving tour of area attractions, to enjoy autumn’s beauty in the Valley/Shore area for a late season ride. The tour will begin around 12 p.m., maps will be provided and the touring cars will return to the Pratt House grounds. The show will remain open for those who do not participate in the tour. Visitors are welcome to explore the grounds and reproduction barn of the 1732 Pratt House. Join your fellow car-enthusiasts for this lovely day in Essex as that weekend also features the decorated Scarecrows On Main Street. For more information, visit www.essexhistory.org or 860-767-0681. There is no rain date for this event. ESSEX — Simpsons’ television writer and producer Mike Reiss is back in Ivoryton with his hilarious world premiere of I Hate Musicals: The Musical. It’s the story of a cranky comedy writer trapped in the rubble of an LA earthquake. His life is playing out before his eyes in the form of a musical — and he hates musicals … With numbers sung by everyone from Sigmund Freud and Satan, will he learn to be less cranky? Previews for I Hate Musicals: The Musical begin Sept. 27 and then the show opens at the Playhouse Sept. 29 and runs through Oct. 15. I Hate Musicals: The Musical features new music composed by Walter Murphy, composer of the 70’s classic A Fifth of Beethoven (which was included in the soundtrack of Saturday Night Fever. The play is one man’s zany ride through relationships with mothers and fathers, analysts and wives and with a host of surprising characters making unexpected appearances. Ultimately, the story is a traditional one about life, love, show business, and the importance of being kind. Reiss, who is writer and producer for the long running TV show, The Simpsons, also created the animated series The Critic; the webtoon Queer Duck and worked on the screenplays for Ice Age: Dawn of the Dinosaurs; Horton Hears a Who! ; The Simpsons: The Movies; and, My Life In Ruins. Ivoryton audiences turned out in droves in the June 2013 for his hilarious play, I’m Connecticut, which was a huge popular and critical success and Comedy is Hard in September of 2014 with Micky Dolenz and Joyce DeWitt. 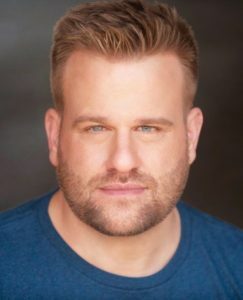 Directed by James Valletti, the cast includes Playhouse favorite R. Bruce Connelly*, and Will Clark, Sam Given*, Amanda Huxtable*, Ryan Knowles*. The set design is by Dan Nischan, lighting by Marcus Abbott and costumes by Elizabeth Cipollina. Tickets are $50 for adults, $45 for seniors, $22 for students and $17 for children and are available by calling the Playhouse box office at 860-767-7318 or by visiting our website at www.ivorytonplayhouse.org (Group rates are available by calling the box office for information.) The Playhouse is located at 103 Main Street in Ivoryton. The staff of OverAbove gather for a group photo in front of their premises at the Witch Hazel Works in Essex. 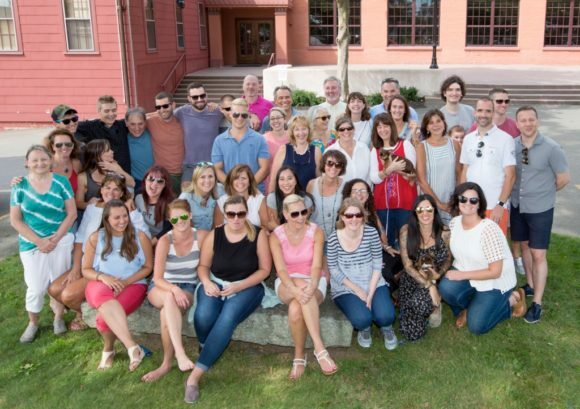 ESSEX – Overabove, a strategic marketing and communications firm based in Essex, Conn., has expanded its business footprint and enhanced its offerings with the opening of a Los Angeles office. The firm’s new office is located in Manhattan Beach on the Manhattan Beach Studios’ Media Campus – a facility where media arts, studio production, new technology and ideas converge. The creative space is just south of Hollywood and bustling with the kind of activity at the heart of Overabove’s culture and services. Seasoned industry leader Tara Walls has been appointed to lead the firm’s new office. As Head of Entertainment for Overabove, Walls will draw upon nearly 25 years of experience in the Hollywood entertainment industry to connect brands with television shows, feature films and talent. She’ll leverage industry relationships and tap her experience in brand integration and promotional partnerships, as well as with music and influencer marketing, to craft customized entertainment partnerships to elevate brands of all sizes. She’ll also create original content to give brands exposure. Walls’ depth of experience in identifying and structuring relationships between Hollywood properties and brands will bring strong added value to Overabove’s clients. While Walls only recently joined Overabove in a formal capacity, she’s been an extension of the Overabove team for more than a decade – collaborating with the firm on a number of entertainment partnerships for shared clients. A resident of Los Angeles, Walls joins the Overabove team after serving as executive vice president of brand integrations & entertainment partnerships at FRUKT and Rogers & Cowan. She previously worked as a product placement executive at two Hollywood film studios. From left to right, back row: State Senator Art Linares; State Representative Jesse MacLachlan; Noel Bishop, First Selectman of Westbrook; James P. Redeker, Department of Transportation Commissioner, and State Representative Devin Carney; front row, Tom Callinan and Sid Holbrook met in Westbrook on Thursday, Oct. 5, to attend the bridge dedication ceremony. WESTBROOK – Shoreline legislators, Connecticut Department of Transportation Commissioner, local officials and residents all came together on Thursday, Oct. 5, at the Clubhouse North Yard Pilot Point in Westbrook for a bridge dedication ceremony. During the 2017 legislative session, Carney, MacLachlan and Linares presented proposals to officially name two bridges in Westbrook. 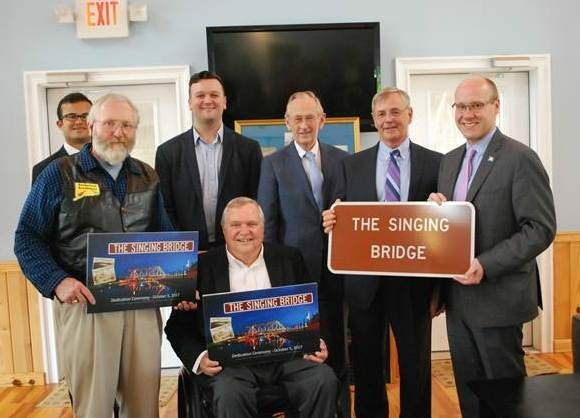 House Bill 5679, An Act Naming A Bridge In Westbrook The “John H. Wilson Bridge” sought to honor John H. Wilson, who passed away in 2015, and was the founder of the Westbrook Historical Society and a veteran of the Korean War. Both proposals were heard at a public hearing on January 30, 2017 in the legislature’s Transportation Committee and later passed into law during the 2017 legislative session. 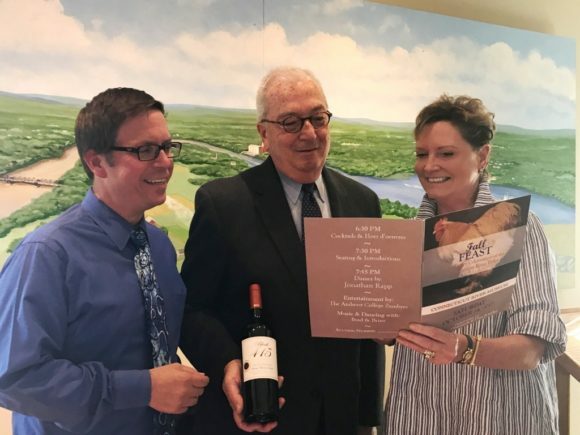 Executive Director Christopher Dobbs, Becker’s Diamonds & Fine Jewelry’s Bill McGuinness and Guilford Savings Bank’s Lisa LeMonte peruse the menu for the 2017 Fall Feast. Photo by Connecticut River Museum. 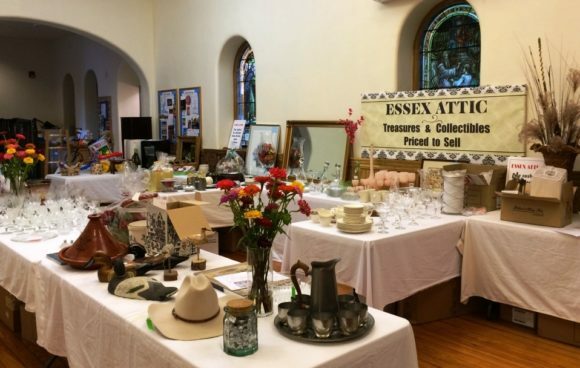 Connecticut River Museum’s 2017 Fall Feast, catered by the River Tavern’s Jonathan Rapp, will be a culinary celebration of the Connecticut River Valley. On Saturday, Oct.14, Fall Feast guests will savor a delicious farm-to-table meal and enjoy a lively performance by the Amherst College, all-male a cappella group, The Zumbyes while overlooking beautiful Essex harbor. The evening will be hosted by WFSB’s Scot Haney who will be auctioning off a spectacular line-up of items including an eight-day/seven-night voyage on American Cruise Lines’ Columbia & Snake River Cruise, a five-night get-away to Nantucket Island, four Trophy Club passes to the 2018 U.S. Open at Shinnecock Hills Golf Club, a six-day/five-night Trek Bike Tour from Prague to Vienna, and a stunning diamond bracelet donated by Becker’s Diamonds & Fine Jewelry will adorn the wrist of one lucky Fall Feast guest. Tickets for the event are $150 and all proceeds benefit the Connecticut River Museum. Contributions from Fall Feast provide critical support for the Museum’s education programs, exhibits, and environmental and cultural programs. Fall Feast 2017 sponsors include: Underwriting Sponsor Becker’s Diamond & Fine Jewelry; Benefactor Sponsors Guilford Savings Bank, American Cruise Lines, Connecticut Rental Center and the Cooper Companies; Sustaining Sponsors Brewer Essex Yacht Yards, C. Sherman Johnson Co., Reynolds’ Garage & Marine, Siris/Coombs Architects and Tower Laboratories; Supporting Sponsors Bogaert Construction Company, Caulfield & Ridgway, Inc., J.N. Mehler, CFP, LLC., Sapia Construction Corp., and Sullivan Lawn Services; Friend Sponsors Clark Group, Essex Savings Bank/Essex Financial Services and Dr. Stephen Sinatra; In-kind Sponsors include Eco/Blast All Inc., and Maris Wacs Design. To purchase tickets and preview auction items, visit www.ctrivermuseum.org or call 860-767-8269. On Saturday, Oct. 14, the Children’s Tree Montessori School at 96 Essex Rd., Old Saybrook, hosts a Family Fall Festival from 11 a.m. to 2 p.m. with pumpkin painting, face painting, music and fun activities. Rain date is Oct. 15. For more information, visit www.childrenstree.org or call 860-388-3536. 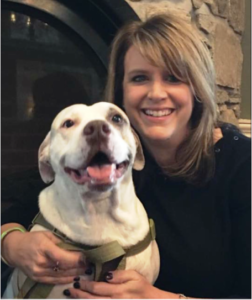 LYME — Reynolds’ Subaru will be hosting Pour for a Pup event Saturday, Oct.14, to help support the Connecticut pound pups. The event will take place in Reynolds’ brand new state of the art facility. All are welcome. This charity event will have wine and beer tastings from Tony’s Package Store and Staehly’s Farm, Tito’s has offered to provide cocktail tastings, fun auction items will be available, Best of Everything Country Gourmet will be catering the event, and DJ Boppers will be providing music! The event will take place 6:30-10 p.m. at Reynolds’ Subaru, 268 Hamburg Road, Lyme CT. To purchase your tickets at $35 per person come to Reynolds’, Malloves Jewelers, or visit www.ctanimalhouse.org. AREAWIDE – The Country School welcomes Minds in Motion back to campus for a full day of fun, fast-paced, hands-on workshops for students in PreK-Grade 6 on Saturday, Oct. 14, when this signature event of the Connecticut Association for the Gifted returns to The Country School for the fourth time. In addition to children’s programming, there will also be free parent and teacher programs designed to help parents explore ways to challenge and inspire their children. There will be free literature, resources, and networking opportunities available, as well as a range of exhibitors, camps, books, and educational toy sales for parents to explore. Over 25 different student workshops this year will range from Sizzling Sensory Science, Life by the Wigwam 300 Years Ago!, Introduction to Robotics, Fencing, Poetry and Math, Owl Pellet Detectives, Paint Like the Masters, Intro to STEAM, 3D Printing and Design, Roller Coaster Physics, Chess, Think Like DaVinci, and more. This year’s keynote for parents will feature a panel discussion on the role of technology in the lives of children. How much is too much? How can you best ensure your child’s safety online? Panelists will include Claudia Califano, M.D., child, adolescent, and adult psychiatrist and Assistant Clinical Professor at Yale Child Study Center; Peggy Chappell, LCSW and Consultant with over 30 years of experience working with children, parents, and teachers; Jerry Zigmont, Owner, MacWorks, LLC, technology consultant with over 30 years experience in technology industry; and Bill Leidt, Technology Director and Technology Teacher at The Country School. 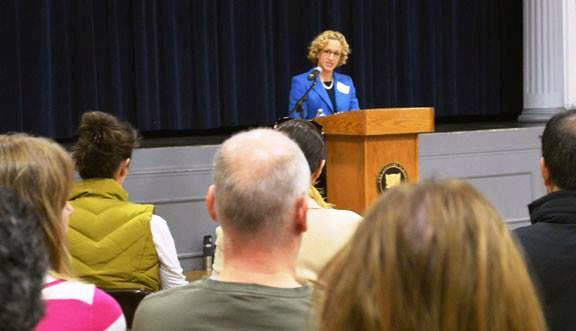 Beth Coyne, Dean of Student Life at The Country School, will serve as moderator. Panelists will also offer parent workshops on this topic. Learn more about the workshops for children and opportunities for adults at http://www.thecountryschool.org/student-life/minds-in-motion. Space is limited and will be awarded on a first-come, first-served basis, so register early to reserve your spot. Registration closed Oct. 7. Founded in 1955, The Country School serves 213 students in PreSchool-Grade 8 on its 23-acre campus in Madison. The Country School is committed to active, hands-on learning and a vigorous curriculum that engages the whole child. Signature programs such as Elmore Leadership, Public Speaking, STEAM, and Outdoor Education help prepare students for success in high school and beyond. See the school community in action during Fall Open House on Oct. 29 from 1-3:30 p.m. Learn more at www.thecountryschool.org. AREWIDE — New London’s St. Francis House will hold a book sale on Saturday, Oct. 14, from 9 a.m. to 2 p.m., to benefit the St. Francis House library. The library, which is open to the public on Mondays from 4 to 6 p.m. or by appointment, offers a unique collection of books on theology, social justice, biography and women’s issues, along with poetry and more. The sale will take place at the non-profit, located at 30 Broad Street in New London. Books in the sale will include children’s books and poetry as well as fiction, spirituality, philosophy and social justice. St. Francis House is an intentional Christian Community, where members share the daily work of living while working to improve the social and economic conditions of the surrounding community. The community supports initiatives and ongoing works, having played a role in the Homeless Hospitality Center, Voluntown Peace Trust, Spark MakerSpace, Drop-In Learning Center, FRESH, Hearing Youth Voices among others. The library at St. Francis House offers a look into the philosophy behind the organization, and guidance for the work which others may contemplate. Early in the history of the organization, the question of valuing written works presented itself, as the late Father Emmett Jarrett was confronted with having to put a price on a soon-to-be-published book of his poetry. The issue for Fr. Emmett, a published New Directions poet, was of detracting from the sacredness of writing by placing a market-based price on it. Carrying on this discussion, books will be offered at the St. Francis book sale for whatever price the buyer deems reasonable; or, for what value the buyer places on the continued operation of the St. Francis House Library. A catalog of the library’s collections may be viewed at www.stfrancishouseNL.org. To schedule a time to visit the library, or for more information on the book sale, contact: stfrancishouseNL@att.net, or 860-437-8890. The Connecticut Probate Court System is an often misunderstood, vitally important part of our community. I am writing to encourage anyone who reads this to cast their ballot for Jeannine Lewis; as I know no one better suited to be our next Judge of Probate in the 33rd District. Having known Jeannine as a caring parent and a polished attorney for almost a decade has been my distinct pleasure. Attorney Lewis has a resume uncannily tailored precisely to this type of work. Aside from being thoroughly skilled in handling the administration of decedents’ estates, she is particularly well suited to handle the lesser known aspects of probate matters as well. More than half of the work performed by probate judges involves children, seniors, persons with mental illness, and adults with intellectual disability. The ability to be a compassionate and understanding advocate for these people is a most critical skill in a probate judge; and Jeannine Lewis has a limitless reserve of compassion, care and consideration for everyone she encounters. Attorney Lewis has adeptly handled many legal matters for my family over the years, and I hope that I am a long way away from needing her services as Judge of Probate; but I will rest far easier knowing that, should the need arise, my family, friends and I will have the best person sitting on the bench. Every one of us is just one bad bump on the head away from possibly needing the probate system to work for us to establish and monitor a conservatorship or oversee the timely administration of our estate assets. As a registered Republican and an elected official, I encourage voters to ignore making this important choice based on party line, and to elect the best person for the job – Jeannine Lewis. because we have been diligent in our efforts. For fiscal year 2016/2017, Town of Essex will once again finish the year with a budget surplus. The surplus is the result of positive variances on both the revenue and expenditure sides versus budget. Higher than anticipated revenue from property tax and local revenue sources were more than sufficient to offset the loss of State revenue during the fiscal year. Expenditures finished the year under budget for both the General Government and Education. Bottom line, the Town will add approximately $161 thousand to the rainy day fund. In addition to that, $260 thousand dollars of surplus was utilized for a one-time payment to pension funds and additional money for capital sinking funds. In other words, our total surplus was over $420 thousand. It has been through the Town’s careful budgeting, healthy fund balance and minimal reliance on State funding sources that earned the Town an increase in credit rating to AA+ with S&P Global Ratings in the face of a downgraded rating for the State of CT. Armed with this improved rating, the Town issued $6 million in General Obligation Bonds on September 19th with a true interest cost of 2.49%. These bonds represented the final financing of the Capital Improvements Program approved at the December 2014 referendum. Moreover, building activity was at a record pace in 2016-17 and businesses throughout town have been opening, including restaurants, galleries, and other retail shops. All in all, I’m proud to say that through the collaborate efforts of our Board of Selectmen the state of our town is in great shape. Editor’s Note: The author id the first selectman of Essex. Let’s stay with what’s working. Norm Needleman and Stacia Libby are doing a great job serving Essex as selectpersons. They and their team have strengthened our financial management, keeping tight reins on the budget while enhancing services. They are moderate and reasonable and work successfully with a broad range of people and opinions. Unlike state and national politics Essex has been able to maintain open dialogue across party lines because our leaders act like the public servants they were elected to be. Let us also be good citizens and go to the polls on November 7th. Vote for what you know has been working and then find ways to pitch in and help this town and it’s leaders to preserve the “best small town” reputation we have rightly earned. The Essex election for first selectman is here again, and I’d like to voice my support for Norm Needleman. Like many folks in Essex, I am not a member of either of the major political parties; for me the reason is that I find the partisanship disheartening. There cannot be a better example than the dysfunction we have today in our federal government. I believe every issue worth discussing should be done so openly and without an allegiance to some party position. This is why I support Norm; while nominally a Democrat, he is a mindful leader that will try and execute a decision based on what is good for the town. I may not agree with everything he has done or will do, but I fully support the way in which he comes to the decisions. I think we are lucky to have him So, vote for Norm, not because he is a Democrat but rather because he genuinely has the best interests of Essex as his core principal. With a 2017/2018 budget of over $24,000,000 and approximately 45 full & part time employees, Essex needs a full-time, hands on First Selectman. Vin Pacileo, the Republican candidate for First Selectman, will devote his full attention and time to the job and he has the experience to very effectively manage the town’s budget and employees. Vin is a former Essex Selectman who currently serves on Essex’s Board of Finance. In addition, he is the chief administrative officer of the town of Stonington (a position he will resign shortly after being elected). His business experience includes management positions at Pfizer, The Hartford and Aetna. Vin has the experience Essex needs and is committed to fighting for fair state support, engaging our community, and growing our tax base. I urge all Essex residents to vote for Vin Pacileo for Essex First Selectman on November 7th. A la Carte: Add a (K)rumble to Key Lyme Pie! Does it make you crazy that Halloween candy was on the shelves in August and today, in mid-October, the stores are already showing lawn reindeer? Yeah, me too. But it’s not too soon to think about Christmas presents, especially as I dream that someone will buy me an Instant Pot for the holidays? I want that Instant Pot now. I can get it on Amazon this very minute and, with Amazon Prime, the shipping is free! But the holidays shouldn’t be about what I want. Yesterday I sent an Instant Pot to my oldest granddaughter, whose birthday is this month. She is a second-year medical student at the University of Minnesota. She and her roommates have little time, and Lily is a good cook. She will let me know whether I should get one for myself. But instead of waiting until the holidays, get a copy for yourself now. These recipes will make you Santa Claus during the holidays. All use a half-sheet pan (13 x 18 inches) and each pie or cake will feed about 16 or 24 people. Here is just one of the 100. Generously butter the inside of a 13- by 18-inch lipped sheet pan. Using a handheld mixer or a stand mixer with the paddle attachment, beat the flour, nuts, both sugars, baking powder and salt in a large bowl at medium speed until uniform, about 1 minute. Add butter chunks and beat at medium-low speed until well blended, about 4 minutes. Add egg white and beat at medium speed until mixture can hold together like dry oatmeal cookie dough when squeezed, less than 1 minute. Scoop 6 cups of the mixture into the prepared sheet pan using clean, dry fingers to press the mixtu5re into an even crust across the bottom (even to the corners, but not up the side of the pan. Position rack in center of the oven. Heat oven to 350 degrees. 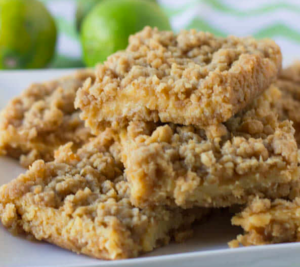 Put cream cheese, condensed milk, lime juice, sugar and egg yolks in a large food processor or blender. Cover and process or blend until smooth. Pour this mixture onto the prepared crust in an even layer. Squeeze small portions of the remaining crumble mixture into little oblongs, then crumble these into little stones and pebble across the filing. Baked until browned and set with a slight jiggle to the center of the pan, about 30 minutes. Cool in the pan on a wire rack for at least 1 hour before cutting into squares. Join Safe Futures this Sunday, Oct. 15, as the organization takes a stand against domestic violence. 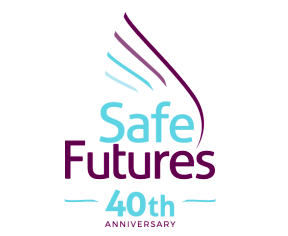 Their efforts during Safe Futures 40th Anniversary Power of Purple 4K Walk will help to bring the community together to show survivors and victims of sexual assault, stalking, and trafficking in southeast Connecticut that they matter and that Safe Futures is there to help them. The walk will be held in the Crystal Mall at Waterford and registration is at 8:30 a.m., speeches at 9:15 a.m. and the walk start is at 9:30 a.m. Registration fees are $25 for adults and $15 for kids. Can you help them during Domestic Violence Awareness Month by honoring and supporting the victims of abuse? AREAWIDE — The CT Shoreline Club of Soroptimist International of the Americas has announced that it is currently accepting applications for its annual Live Your Dream award. The award seeks to support women who serve as the primary wage earners for their families seeking financial assistance to continue their education or to receive training. Information and an application are available at https://soroptimistnortheasternregion.org/files/ShorelineLYDapplication2018.pdf, or by contacting the co-chair Mary Jean Cummiskey at maryjeancummiskey@gmail.com. The application deadline is Nov. 15. Applicants will be notified in January 2018. The CT Shoreline club will provide a $1,000 cash grant to its award recipient, who will then advance to the Soroptimist Northeast Region level, where recipients could receive up to an additional $5,000. The program culminates with three finalist $10,000 awards. Recipients can use the Live Your Dream Award to offset costs associated with their efforts to attain higher education or additional skills and training. This includes tuition, books, childcare, carfare or any other education related expense. Nationally, the Live Your Dream Award provides over $2 million in cash grants to head-of-household women in need each year. Since the program’s inception in 1972, more than $30 million has helped tens of thousands of women achieve their dreams of a better life for themselves and their families. A study conducted by The Fels Institute of Government, a research and consulting organization based at the University of Pennsylvania, confirmed the efficacy and impact of this program. It improves the recipients’ quality of life; builds their confidence; strengthens their self-determination and makes them want to, in turn, help others. Helping women in this way has the demonstrated effect of leading to stronger communities, nations and the world. Chartered in February 2017, the new CT Shoreline club is part of Soroptimist International of the Americas, a global organization that works to improve the lives of women and girls through programs leading to social and economic empowerment. CT Shoreline members join with almost 80,000 Soroptimists in about 120 countries and territories to contribute time and financial support to community-based projects benefiting women and girls. Soroptimist, a 501(c)(3) organization that relies on charitable donations to support its programs, also powers LiveYourDream.org—an online community offering offline volunteer opportunities in support of women and girls. For more information about how Soroptimist improves the lives of women and girls, visit www.soroptimist.org. This new chapter welcomes members. To learn more, visit www.soroptimistner.org or www.liveyourdream.org. Application deadline is Nov. 15. Applicants will be notified in Jan. 2018. OLD SAYBROOK – KeyBank is presenting the Super-Size-Me Food Drive to benefit the Connecticut Food Bank. Through Oct. 28, special collection boxes for nonperishable food donations will be placed at KeyBank branches in nine towns across the area served by the Connecticut Food Bank. KeyBank will also host an online virtual food drive, allowing individuals who may not be able to visit a branch to support the Food Bank with a financial donation. The drive is the inspiration of KeyBank employee James Trimble, a longtime volunteer with the Connecticut Food Bank that has made his annual drive a tradition, along with volunteer work at other food bank activities. Beaudreau said the drive will support the work of the Connecticut Food Bank, which distributes food through a network of more than 600 community based food assistance programs. An average of 148,000 people visit the programs each month seeking help with food needs. Jeff Hubbard, KeyBank Connecticut and Western Massachusetts Market President, said that James Trimble has been named KeyBank’s Connecticut Food Bank Ambassador. Food drop boxes will be placed at KeyBank branches in Old Saybrook, as well as eight other locations. More information about the drive and a way to make a financial donation online can be found at www.ctfoodbank.org/keybanksupersizeme. that is what I intend to do. While our nation is buffeted by divisive elements of political correctness, identity politics and the illiberal winds of intolerance blowing on our college campuses, we have so much more that unites us than separates us. The core of my campaign is our common humanity. We are all sisters and brothers, children of God. our fellow citizens have voted with their feet and have headed off to Republican-led states where jobs are more plentiful and the cost of living more reasonable. We need Republican leadership of Connecticut to get our fiscal house in order and to create the conditions to nurture business in our state. In addition, we have almost 7,000 K-12 students on wait lists for charter schools. That means 7,000 charter school seats should be made available to those students as soon as possible. Education is freedom. There are also elements of the Administrative State that need to be dismantled or lessened to accentuate the liberty of the individual in his or her private and economic spheres. Again, this resonates across all social strata. Gratitude, common humanity and liberty are the core of my message at www.SaveConnecticut.com along with the additional eight universal principles that Republicans, Democrats and independents all share! It is for the Republicans to embrace their role as the Big Tent party and unify behinds jobs and education. I respectfully ask for your vote and look forward to meeting you on the campaign trail over the coming months! Riverside, Conn.Editor’s Note: The author is a Republican Candidate for Governor, 2018. Come to a story time for babies, newborn to 24 months. Simple stories and songs, followed by play and social time. Older siblings may attend. Fun Friday on Oct. 6, 13, 20, 27, at 10:30 a.m. Stories and songs in an interactive setting, followed by craft and open play. Perfect for the preschool set. Get ready for two special Fun Friday Guests this month. Rick Daniels from the Deep River Fire Department will come with his truck on 10/13 and ABC Amigos brings a Spanish story time on 10/20. Brick Bunch is back on Oct. 5 & 19, from 3:45 to 4:45 p.m.
Open Lego play with friends. We provide the bricks, you bring your imagination. Cook Club makes Mountain Dew Ice Cream, Oct. 18, at 5:30 p.m. Deep River Drive-in, evening edition, Oct. 25, at 5:30 p.m. Pop in for a fun Halloween movie, Trick or Treat on Sesame Street. This film has a running time of 75 minutes. No registration required. Box car seating for the first 20 kids. OLD SAYBROOK – The Katharine Hepburn Cultural Arts Center and Community Music School are partnering again under the umbrella of their performing arts summer camp, ‘Kate’s Camp for Kids,’ to present a holiday after-school program and show entitled ‘Elflandia.’ This exciting program takes place at The Kate, 300 Main St. in Old Saybrook, and runs for 11 weekly sessions on Wednesday afternoons from 4 to 5 p.m. beginning Oct. 18. Launched in 2013, Kate’s Camp for Kids is a performing arts camp for children incorporating music, dance, theater, and visual art. The after-school program is offered for ages 7-10. Directed by Martha Herrle, a 15-year member of the Community Music School faculty and certified Kindermusik educator, this year’s show theme will be ‘Elflandia.’ In Elflandia, the land of Santa’s elves, they are busy making toys and getting ready for Santa’s yearly trip around the world to bring presents to all the deserving humans on the planet. Do human beings really exist? The reports the elves have heard are not very encouraging. Many are grumpy, stressed and loud. Discover what the elves learn about humans when Santa shows up with a real living example. The ensuing effort to get Elfie Selfies with as many humans as possible makes for a rousing finale! The cast will rehearse traditional children’s choral repertoire to be performed at the Community Music School Holiday Concert on Dec. 10, and prepare the show Elflandia: a “short” musical about a land of big dreams and curly toes, with a performance on stage at the Kate on Dec. 13. Tuition for this afterschool program is $165 and scholarships are available for families with a financial need. For additional information and to register, visit www.community-music-school.org or call 860-767-0026. OLD SAYBROOK — Lights. Camera. ACTON! The Acton Public Library in Old Saybrook presents a Leading Legends Series this fall on second and fourth Fridays in September and October and on the second Friday only in November and December at 1 p.m. upstairs in the Grady Thomas Room. The film series will feature legendary actors and actresses in rich and legendary stories. There will be free popcorn, and an informal introduction and discussion following the films. Dec. 8: Florence Foster Jenkins starring Meryl Streep. For more information, call The Acton Library at 860-395-3184, or visit the library during regular hours: Monday through Thursday 10am – 8:00pm, Friday and Saturday 10am – 5pm or visit on-line at www.actonlibrary.org . DEEP RIVER — On Saturday, Oct.7, join Deep River nature writer and local author Katherine Hauswirth from 2 to 4 p.m. for an introductory workshop on nature writing. The workshop portion will include an overview of nature writing formats and authors, a free handbook on getting started, and time for participants to be on their own in nature and record some preliminary ideas or phrases. Copies of Hauswirth’s latest release, The Book of Noticing: Collections and Connections on the Trail, will be available for sale. Space is limited. Call the library at 526-6039 to reserve your spot. Middlesex Hospital Cancer Center is expanding its services to the Connecticut shoreline and will hold an open house at its second location on October 7 from 10 a.m. until noon. The new Cancer Center shares space with the Middlesex Hospital Shoreline Medical Center at 250 Flat Rock Place, Westbrook, and will be a full service, accredited cancer center that will provide Connecticut shoreline residents with care closer to home. The center will begin treating patients in November and will offer all of the same services that patients receive at the Cancer Center’s Middletown location. It will also benefit from Middlesex Hospital’s membership in the Mayo Clinic Care Network. On Oct. 7, members of the public will be able to tour the new Cancer Center and learn more about the services offered, including cancer treatment, integrative medicine and genetic counseling. CHESTER – Come Home to Chester, the long-observed annual event the first Friday of October in the downtown, will be observed this year on Oct. 6 from 5 to 8 p.m. with crisp Autumn apples for all and special events in all the galleries, shops and eateries. The apples, supplied at cost by Scott’s Orchards in Deep River, will be given to visitors at eight locations: Maple and Main Gallery, The Perfect Pear, Ruba Ruba, Dina Varano Gallery, The French Hen, Lori Warner Gallery, Chester Package Store and Lark. A donation jar will be at each “apple” location with hopes visitors will help the Chester Merchants organization defray the costs of Winter Carnivale – a free annual event for the community in February. Apples or not – every place in town will be open with special enticements. 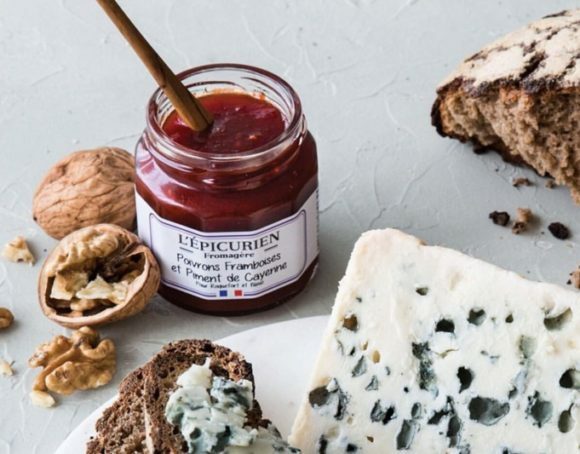 For instance The French Hen will be offering tastings of gourmet products imported from Europe, and the Perfect Pear will give away owner Laura Grimmer’s home-made marshmallow popcorn “ears of corn” with any purchase. 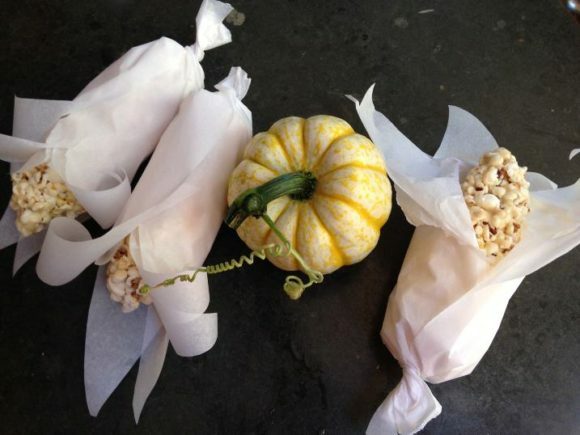 Enjoy marshmallow corn from The Perfect Pear. Arrowsmith will be performing live at Leif Nilsson’s Gallery, and outside the soon-to-open Grano restaurant, owner Joel Gargano will be serving samples of his homemade bread and fall soup. The Chester Historical Society will be serving refreshments from 5:30 to 7:30 p.m. at the Mill Museum to those who come to see its exhibits of Chester postcards, the Leatherman and Nate Jacobson’s Grist Mill replica. 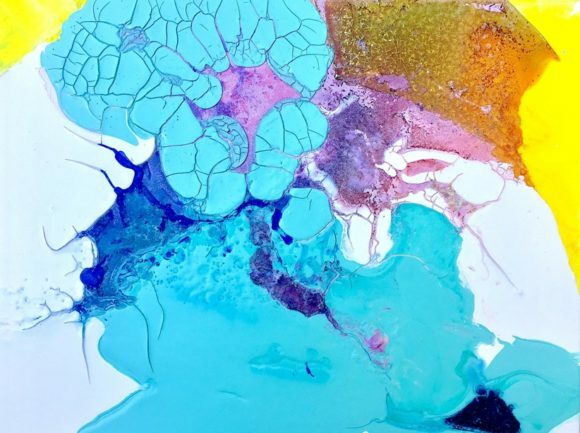 At Maple and Main Gallery, there will be an opening party for “Oasis,” Chester resident and artist Kate Hair’s solo exhibit of recent paintings. Wine, appetizers and desserts will be served including apples with cheese and other “apple” surprises. At Ruba Ruba, a new collection of sweater designs will be featured and there will an opening reception for Deep River artist Gray Jacobik whose paintings will be in the windows of the store during October. Spiked apple cider will be served. Lark will introduce a new jewelry line by Alison Grondino and serve wine and sweet apple treats. 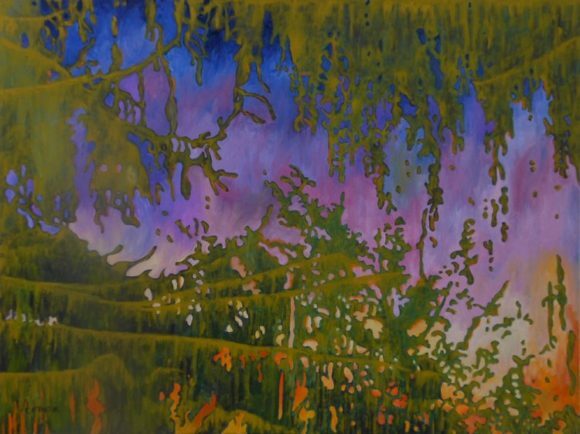 ESSEX — The ninth annual Five Women Painting show Oct. 6 through 9 at the Essex Art Association Gallery features a large selection of new works by Pam Carlson, Rosemary Cotnoir, Claudia Van Nes, Kathleen DeMeo and Janet Rayner. The gala opening party is Friday, Oct. 6, from 5 to 8 p. m when a selection of wines, homemade appetizers and desserts will be offered and all five artists will be on hand to greet visitors. The show showcases a wide diversity of styles, medium, sizes and price point by these five established artists. Kathleen, who lives in Old Lyme, primarily does abstract monotypes and Rosemary, from Essex paints large semi-abstract oils and does stone sculptures, Pam, also from Essex, paints water scenes and landscapes in acrylic, Janet from Haddam uses pastels for her realistic paintings while Chester resident, Claudia works in mainly in watercolor. On Saturday, Oct. 7, from 1 to 4 p.m., Janet will give a pastel demonstration and on Sunday, Oct. 8 from 1 to 4 p.m., Claudia will do a painting using pen and ink and watercolor and Pam will do an acrylic demonstration. There will be a free drawing for a painting during the exhibit as well. The show is Friday from 5 to 8 p.m. and by chance that afternoon; Saturday and Sunday from noon to 5 p.m. and Monday, 11 a.m. to 3 p.m. The Essex Art Association Gallery is at 10 North Main Street; 860-767-8996. See Five Women Painting Facebook page. DEEP RIVER — An internationally known paranormal researcher, Dustin Pari presents Documenting the Dead at Deep River Public Library, Friday, Oct. 6, from 6 to 7:30 p.m. This program takes a look at conduct paranormal investigation. Pari will discuss his own experiences, including some of the earliest spirit communication techniques. Complete with historical stories, documentation, and some “would-be” evidence, Pari provides a respectful retrospective piece on contacting the other side. Filled with anecdotal talks from his travels and evidence from his investigations, this lecture is just the right mix of educational, fun, and creepy. Space is limited. Registration is required. Visit the Deep River Library website, Facebook Event page or call for more details. For more information, go to website at http://deepriverlibrary.accountsupport.com and click on our monthly calendar, or call the library at 860-526-6039 during service hours: Monday 1 – 8pm; Tuesday 10 am – 6 pm; Wednesday 12:30 – 8 pm; Thursday and Friday 10 am – 6 pm; and Saturday 10 am – 5 pm.